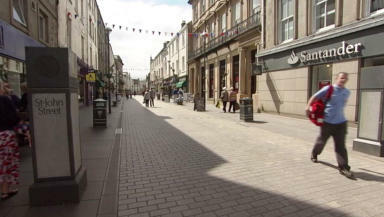 The figures show that Scotland has a higher rate of shops lying vacant than England. High street: One in eight shops lay vacant. SRC director David Lonsdale said the numbers offered "few crumbs of comfort" for retailers. He said: "The shop vacancy rate spiked once again, to the highest figure for five years, and the fourth successive quarter that the rate has been above 10%. "It is troubling that almost one in every eight retail premises in our town centres now lies vacant, more so with retailers' business rates bills set to escalate by a further £13.2 million this coming April. "Whilst shopper footfall recorded its best performance for five months, offering a glimmer of light, the fact is it still contracted compared to a year ago, albeit at a less pronounced rate than over the past quarter and indeed year as a whole. "This is further proof of the profound transformation affecting the retail industry, due to changing shopping habits, rising cost pressures and becalmed consumer spending. "Retailers and shopping destinations are clearly going to have to work harder to attract custom through a blend of improvements to service, experience, pricing and promotions. "Policymakers can play their part through a more concerted effort to halt and then begin to reverse relentless rises in costs."